Little passing London tourists would ever guess that the premises of Bulgari, the upmarket jewellers in New Bond Street, had anything to do with the pope. Nor indeed the nearby headquarters of the wealthy investment bank Altium Capital, on the corner of St James’s Square and Pall Mall. But these office blocks in one of London’s most expensive districts are part of a surprising secret commercial property empire owned by the Vatican. Behind a disguised offshore company structure, the church’s international portfolio has been built up over the years, using cash originally handed over by Mussolini in return for papal recognition of the Italian fascist regime in 1929. Since then the international value of Mussolini’s nest-egg has mounted until it now exceeds £500m. In 2006, at the height of the recent property bubble, the Vatican spent £15m of those funds to buy 30 St James’s Square. Other UK properties are at 168 New Bond Street and in the city of Coventry. It also owns blocks of flats in Paris and Switzerland. The surprising aspect for some will be the lengths to which the Vatican has gone to preserve secrecy about the Mussolini millions. The St James’s Square office block was bought by a company called British Grolux Investments Ltd, which also holds the other UK properties. Published registers at Companies House do not disclose the company’s true ownership, nor make any mention of the Vatican. Instead, they list two nominee shareholders, both prominent Catholic bankers: John Varley, recently chief executive of Barclays Bank, and Robin Herbert, formerly of the Leopold Joseph merchant bank. Letters were sent from the Guardian to each of them asking whom they act for. They went unanswered. British company law allows the true beneficial ownership of companies to be concealed behind nominees in this way. Research in old archives, however, reveals more of the truth. Companies House files disclose that British Grolux Investments inherited its entire property portfolio after a reorganisation in 1999 from two predecessor companies called British Grolux Ltd and Cheylesmore Estates. The shares of those firms were in turn held by a company based at the address of the JP Morgan bank in New York. Ultimate control is recorded as being exercised by a Swiss company, Profima SA. British wartime records from the National Archives in Kew complete the picture. They confirm Profima SA as the Vatican’s own holding company, accused at the time of “engaging in activities contrary to Allied interests”. 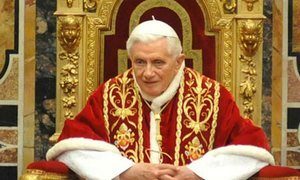 Files from officials at Britain’s Ministry of Economic Warfare at the end of the war criticised the pope’s financier, Bernardino Nogara, who controlled the investment of more than £50m cash from the Mussolini windfall. Nogara‘s “shady activities” were detailed in intercepted 1945 cable traffic from the Vatican to a contact in Geneva, according to the British, who discussed whether to blacklist Profima as a result. “Nogara, a Roman lawyer, is the Vatican financial agent and Profima SA in Lausanne is the Swiss holding company for certain Vatican interests.“ They believed Nogara was trying to transfer shares of two Vatican-owned French property firms to the Swiss company, to prevent the French government blacklisting them as enemy assets. Earlier in the war, in 1943, the British accused Nogara of similar “dirty work“, by shifting Italian bank shares into Profima‘s hands in order to “whitewash“ them and present the bank as being controlled by Swiss neutrals. This was described as “manipulation“ of Vatican finances to serve “extraneous political ends“. From the outset, Nogara was innovative in investing the cash. In 1931 records show he founded an offshore company in Luxembourg to hold the continental European property assets he was buying. It was called Groupement Financier Luxembourgeois, hence Grolux. Luxembourg was one of the first countries to set up tax-haven company structures in 1929. The UK end, called British Grolux, was incorporated the following year. When war broke out, with the prospect of a German invasion, the Luxembourg operation and ostensible control of the British Grolux operation were moved to the US and to neutral Switzerland. The Mussolini investments in Britain are currently controlled, along with its other European holdings and a currency trading arm, by a papal official in Rome, Paolo Mennini, who is in effect the pope’s merchant banker. Mennini heads a special unit inside the Vatican called the extraordinary division of APSA – Amministrazione del Patrimonio della Sede Apostolica – which handles the so-called “patrimony of the Holy See“. According to a report last year from the Council of Europe, which surveyed the Vatican’s financial controls, the assets of Mennini‘s special unit now exceed €680m (£570m). While secrecy about the Fascist origins of the papacy’s wealth might have been understandable in wartime, what is less clear is why the Vatican subsequently continued to maintain secrecy about its holdings in Britain, even after its financial structure was reorganised in 1999. The Guardian asked the Vatican’s representative in London, the papal nuncio, archbishop Antonio Mennini, why the papacy continued with such secrecy over the identity of its property investments in London. We also asked what the pope spent the income on. True to its tradition of silence on the subject, the Roman Catholic church’s spokesman said that the nuncio had no comment.